When you think of an athlete, you probably think about traditional sports images: highly competitive men and women with gifted physical traits, competing at the highest levels for fame and fortune. In eSports, the idea of an “athlete” changes — depending on your perspective. To a skeptic, a professional gamer can be an out of shape, antisocial youth that has no career, education, or personal relationships off the internet. The reality is a professional gamer exhibits many of the same qualities a traditional sports athlete displays. eSports athletes are highly disciplined, motivated professionals that pour their hearts and souls into their craft, developing strategies and mastering the mechanics they need to succeed. Just like any other athlete. So what’s the real difference between a traditional athlete and a professional gamer? Unlike traditional sports, a physical disability doesn’t leave a professional gamer all but exempt from competing at the highest levels. 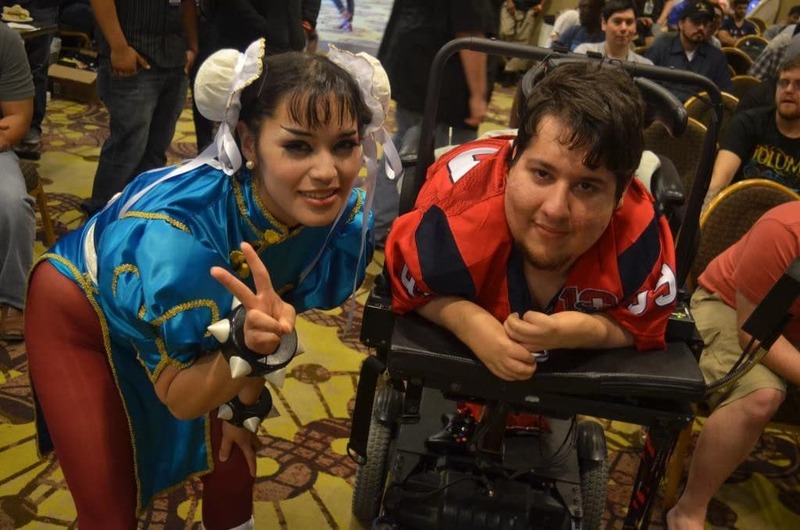 Mike ”Brolylegs” Begum, born with Arthrogryposis and Scoliosis, is a mainstay in the Street Fighter community, having competed in many of the main events for nearly a decade (and recently sponsored by AbleGamers), consistently outperforming expectations. He’s reached Professional status playing Chun-Li, one of the more technical fighters in the Street Fighter V roster, and recently got out of pools on the winners side at EVO 2017, the biggest fighting game tournament of the year..
Randy “N0M4D” Fitzgerald, like Brolylegs, was born with Arthrogryposis, and is one of, if not the first, disabled competitors to gain widespread attention competing in the Major League Gaming circuit. He is most known for having his own control scheme in the Call of Duty franchise and his competitive history with first person shooters, but he has also been a fighting game player his whole life, and is planning to focus on Street Fighter V full time in the near future. 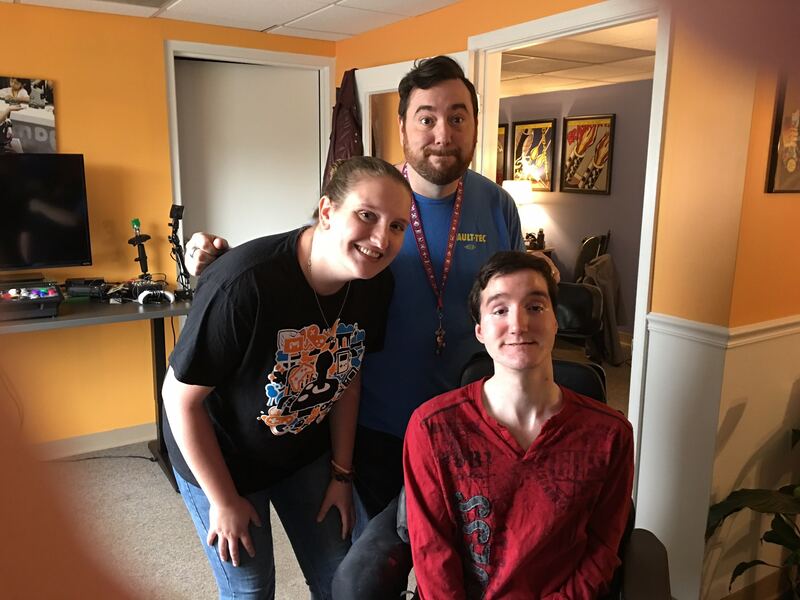 Dayton “Wheels” Jones, despite having Spinal Muscular Atrophy type II, is one of the premiere Killer Instinct players in the world, having finished 2nd at Combo Breaker and 5th at the Killer Instinct World Cup 2017, shaping up to be one of his most successful seasons yet. He is currently sponsored by Ultra Arcade. Chris “Phoenix” Robinson, who is completely deaf in his left ear and has severe hearing loss in his right ear, competes in a myriad of titles, from Street Fighter to Tekken, and founded DeafGamersTV, an organization for deaf gamers that advocates for subtitles and appropriate sound options in games. Each of these gamers has overcome their disability to do extraordinary things in the competitive space, competing with the best in the world and advocating inclusiveness in eSports. While these athletes have different levels of fame and notoriety in the scene for their respective games of choice, they are all avid competitors and have their fair share of accomplishments. Brolylegs learned to game on the Super Nintendo when he was 2 years old, by using his wrist to hold the controller and his face and mouth to press buttons, navigating through games such as Super Mario Bros. 3 and Donkey Kong. Phoenix grew up on games like Street Fighter II: The World Warrior and King of Fighters ‘94, before gravitating naturally towards the arcade versions of games like Marvel Vs. Capcom 2, competing against whoever was around at the time. Wheels cut his teeth in the fighting genre going all the way back to the original Playstation, honing his craft on games like Tekken. Pokemon Blue was one of his first loves as a gamer, but his competitive side really started to take control when Call of Duty 4 was released in 2007. He participated heavily in the scene at the time, climbing the Gamebattles ladders until a few years later when Super Street Fighter 4 brought him back to the fighting genre for good. N0M4D grew up in the age of arcades. One of the first games he remembers playing, and even competing in, was Pac-Man, having his father lift him onto the arcade cabinet so he could play. At the age of 4, he entered a tournament at his local bowling alley, where he took third place. It was at that point his drive to win blossomed. N0M4D has one big issue with eSports. In his view, organizers and leagues tend to cater to elite players that carry big name sponsors, in turn doing away with the grassroots feel eSports has made it’s name on in the mid to late 2000’s. “It seems to me they’re more willing to include more people, so in that aspect I don’t think there is any kind of discrimination, per se, but I also feel like it has become more of an elite sport,” N0M4D said, citing increasing entry fees and a central focus on sponsored players that makes it less likely that people with disabilities can feasibly attend tournaments. “I can’t fly, because my legs don’t bend well enough to fit in an airline seat, and last time I did fly they broke my wheelchair to pieces,” said N0M4D. “For me to travel, I usually take a bus or AmTrak. I don’t only have to pay for myself, but I have to pay for two personal care assistants to come with me, which doubles the cost of the hotel room and the travel cost. 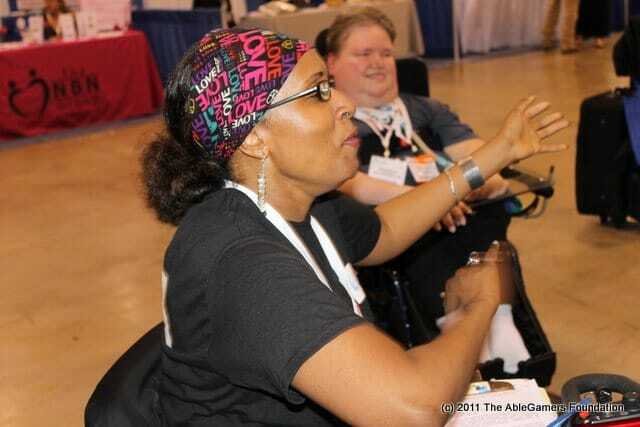 Many gamers with disabilities in the competitive scene deal with these same financial issues. 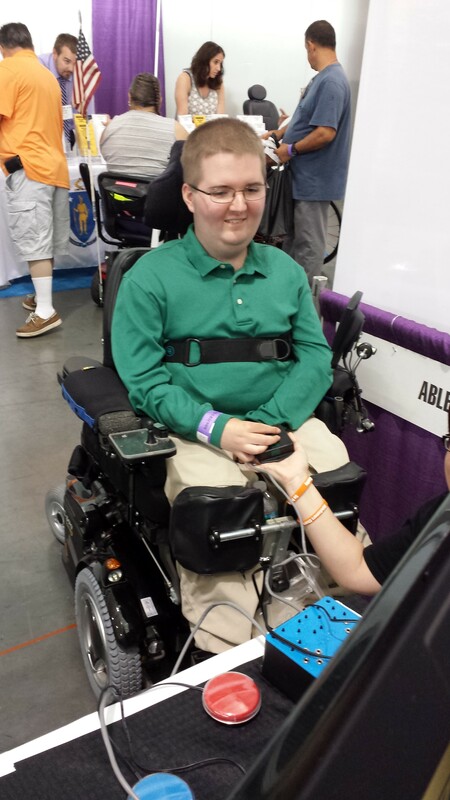 Brolylegs also knows how difficult travel can be for a competitor with disabilities, having recently struggled with a breakdown of the ramp in his handicap accessible van. Such vans often carry exorbitant repair costs, and buying a new accessible van, which start at around $25,000, can be as expensive as buying a Mercedes Benz or other luxury car, topping out at around $150,000. For most people with disabilities like N0M4D, Wheels or Brolylegs, this is a cost that can be insurmountable. Even after conquering the financial hurdles of getting to these events, competitors with disabilities have to deal with the fact that tournament equipment and venue layouts often clash with their needs. While the number of competitors with physical disabilities are a small percentage of the overall entry pools, tournament organizers need to make more effort to make sure venues can accommodate athletes that require help. While Wheels doesn’t seem to mind being lifted up by four people, but for most gamers with disabilities, being lifted onto a stage would be an unacceptable alternative to accessible stage designs and venue layouts. N0M4D, who traveled the Major League Gaming circuit in the mid 2000’s, recalls a time he needed tournament officials to accommodate him. 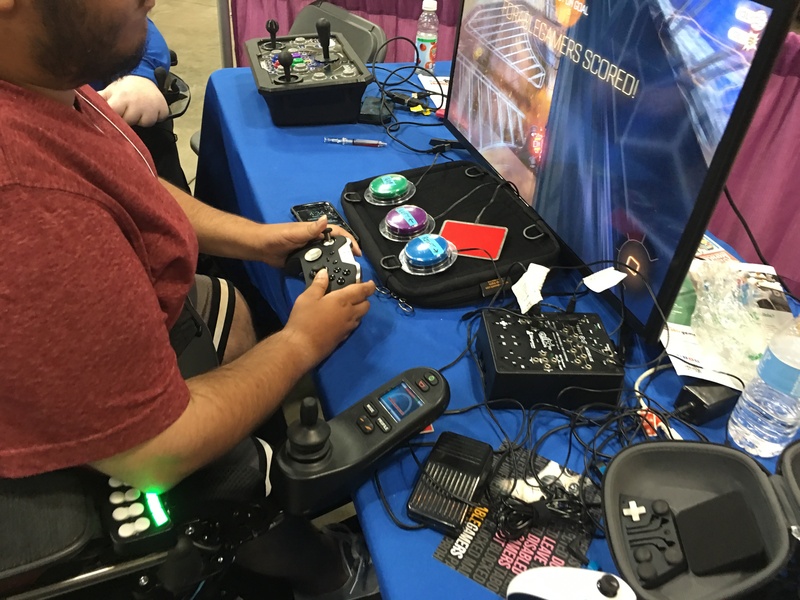 Currently, there are no accessibility standards for professional tournaments, and tournament organizers have differing views and acceptance of competitors with controllers modified for accessibility. N0M4D uses either a modded controller, which can be quite expensive, or a Titan One plugin that allows him to customize controller settings and set button macros, allowing him to press the buttons he needs that he can’t usually reach due to his disability. The Evolution Championship Series (EVO for short), the premiere fighting game tournament of the year, doesn’t allow competitors to use a Titan One due to a timeout issue that occurs when attempting to use an Xbox controller on a PS4 system with the device, leaving N0M4D in a difficult spot. He recalls an E3 event for Dead or Alive 5 where the organizers were hesitant to let him use a modded controller, partly due to security concerns, while also encouraging competitors to use a certain branded fight stick from one of the tournament’s sponsors. Despite their concerns, or perhaps biases, N0M4D ended up winning the event, beating some of the best DOA 5 players in the world at the event. It was a lesson for all in attendance, that people with disabilities can accomplish great things and accessibility technology might be the push they need, not to give them an unfair advantage or put them over the top, but to put them on an even playing field and let their natural talent shine through. Not every player has to go through such an ordeal to allow their technology to work. Brolylegs and Wheels use more traditional controllers, such as an Xbox 360 controller and an Xbox Elite controller, respectively. However, due to their disabilities, they had to learn how to play very differently than most. 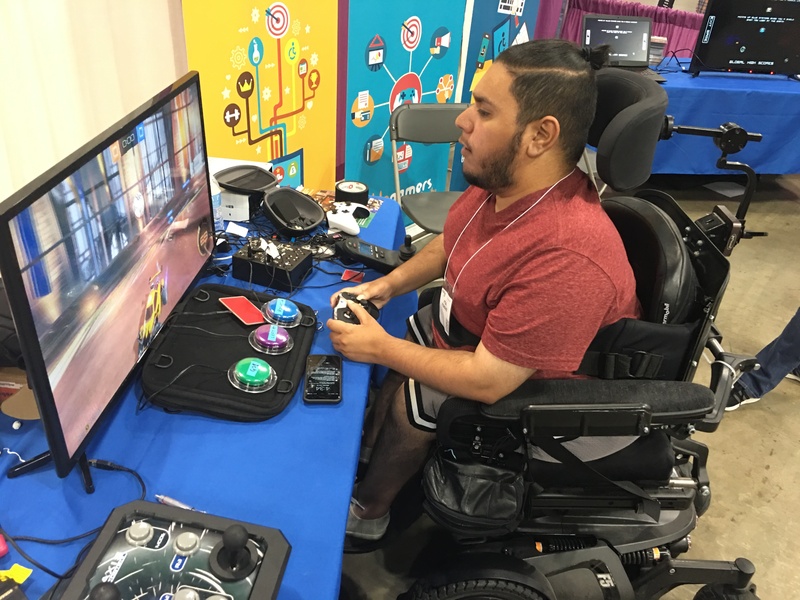 For many gamers with disabilities, learning how to play games comes naturally by adapting to the abilities they have from birth and growing up experimenting with controllers and methods of holding them. Since they cannot use their hands and arms normally like most people, Brolylegs and N0M4D learned how to play by laying their faces on the controller and pressing the majority of buttons with their mouths. 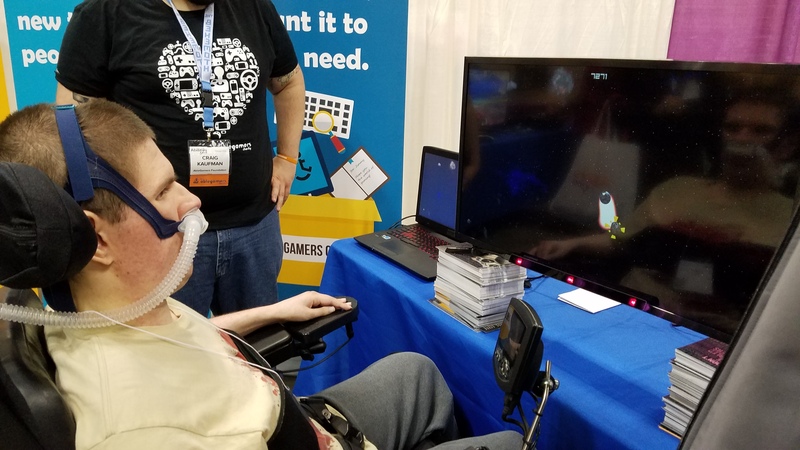 For other gamers with disabilities, the abilities and challenges of their bodies change over time, resulting in a constant need to readjust the way they do everything, from gaming to every day tasks. Wheels notes that macro buttons and control options in games are a big proponent of whether he can successfully play them or not. While he customized the switches on his Elite controller to be able to reach all the controls he needs in order to feel comfortable, macros are one of the only ways he can pull off all the moves and techniques he needs to be successful. “I hope future games allow more mapping options in controller layouts,” he concluded. While Phoenix doesn’t have any problem holding a controller or reaching all it’s buttons, deafness is a huge disadvantage as a competitive gamer. Competing at the highest level requires a player to use every tool at their disposal, and one of those tools in fighting games are sound cues. A lot of timing and repetition is tied intimately with tempo and sound, and not being able to hear something your opponent can hear puts you at a disadvantage. While Phoenix advocates for subtitles covering all sound in games, many developers stick to minimalistic subtitles that lack the needed depth. One of the ways Phoenix adapts around a lack of sound is by using a SubPac, a vest that allows the wearer to “feel” sound through vibration in the vest. Still, Phoenix has his fair share of difficulties when navigating the venue. Not being able to hear announcements and stage assignments has lead to moments of confusion. Oftentimes he has to wait around until his pool is finished in order to avoid missing an announcement that he wouldn’t be able to hear otherwise. “It would be awesome if tournament can maybe provide a certified sign language interpreters if there is going to be an announcement for something big though,” suggested Phoenix. Fighting games are unique in that while First Person Shooters require precise aim, timing and reaction skills, fighting game players can be successful mainly by way of prediction and outsmarting their opponent, noticing patterns in their play and punishing mistakes. While reflexes and timing certainly play a key part in any game, relying on them alone won’t get you very far. Though these four champions have proven time and time again that their skill is up to par with (and even surpassing) their able-bodied competitors, each of them has been met with skepticism, doubt and even mockery at times from other competitors that refuse to believe someone with a disability could be the very best. N0M4D recalls a story from MLG Charlotte in 2007, one of his first offline competitive tournaments playing Rainbow 6 Vegas, when he and his team were setting up for their first match when a member of the opposing team protested to the referee. N0M4D certainly isn’t alone. People with all forms of disabilities have to deal with the blank stares, doubts and ridicule that come from the general public’s ignorance of their condition and needs. For some reason, the thought that a person with a physical disability can compete at the highest levels of an activity is especially perplexing to some, as if the fact that they are disabled automatically disqualifies them from performing better than an able-bodied person. Each athlete has dreams of being the best, continuing to hone their craft and to prove the world wrong. One thing none of them lack is motivation. For Brolylegs in particular, his goal is one of the highest leagues in the fighting community and one of the crown jewels of competitive Street Fighter V: the nationally televised ELEAGUE. ELEAGUE is an Invitational tournament featuring up to 32 of the best Street Fighter V players in preliminary groups, battling it out for the chance to make the top 8 and a shot at a $250,000 prize pool. The latest season featured legendary names like Justin Wong, Daigo Umehara, LI Joe, and eventual winner Punk, who won a grand prize of $150,000 and parlayed his strong showing in ELEAGUE into a 2nd place finish at EVO 2017. When the topic of ELEAGUE came up, N0M4D was adamant: Brolylegs deserves his chance. 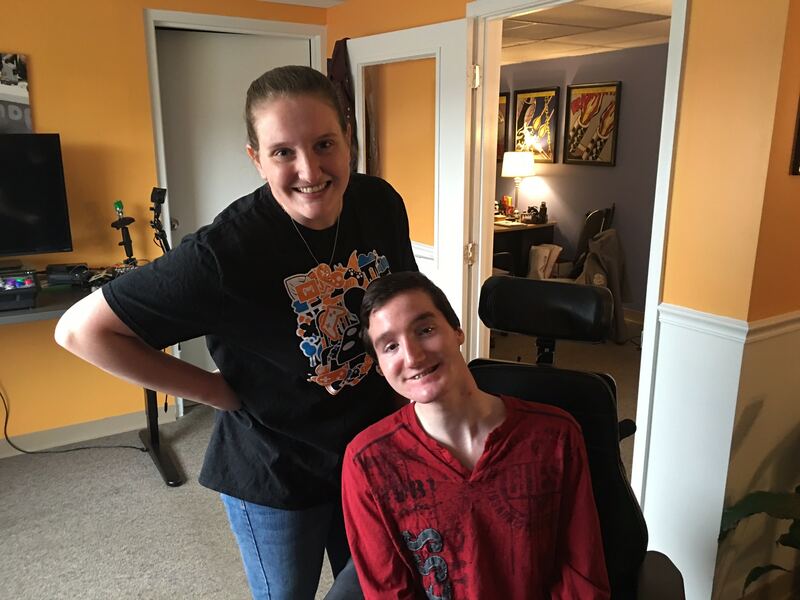 For Phoenix, having not hit quite the same levels of achievement and fame as the others, he just wants to keep improving and make a name for himself, proving to the world that he can be one of the best with hard work and dedication, while at the same time raising awareness and appreciation for deaf gamers around the world. Each of these athletes has been a massive drive to prove themselves and spread awareness and acceptance of disabilities as a whole. Brolylegs made no mention of money when discussing ELEAGUE, instead pointing to the platform he would have to educate the world about disability and inspire gamers with disabilities around the world. N0M4D lamented that eSports were becoming too big, as he prefers the grassroots feel of massive, open competitions with little to lose and much to gain. According to Newzoo, a market research and intelligence agency that specializes in mobile and eSports markets, total eSports revenue will hit $696 Million in 2017 and projects revenues to nearly triple to $1.5 Billion by the year 2020. This growth comes on the back of increased viewership and brand investment, making eSports one of the fastest growing industries in the world. Indeed, large scale televised gaming competitions, which will become the norm in upcoming years as eSports popularity continues to skyrocket, may be wary of including people with disabilities, due to either unwillingness to accommodate their needs or fear that it may not make for a flashy show. “I’m hoping what happened to me with Syfy didn’t happen to Brolylegs with TBS,” said N0M4D. In 2009, N0M4D experienced this first hand with the second season of WCG Ultimate Gamer on Syfy, whom he said he tried out for and was in talks to be featured on the show. After getting three call backs and significant interest after trying out, the network pulled away, stating to him that it would be too difficult to accommodate his needs and make them fit in line with the show. While Brolylegs has said that he was not contacted by ELEAGUE, we will never know how much having a disability plays into a tournament organizers decision whether or not to invite them to a premiere event. However, the stigma of having a disability and the usual reactions that accompany having said disability point toward a dire need for increased inclusion and acceptance in this new age sporting arena. For ELEAGUE, the format and schedule seems like the perfect opportunity for a gamer with disabilities to be featured on a live television gaming competition. With Brolylegs’ positivity, determination and hard work, not to mention skill level, his inclusion in such tournaments is less of a choice and more of a no-brainer. As eSports continues to grow into a multi-billion dollar industry, more and more athletes with disabilities will dedicate their time to training and reaching the pinnacle of their game of choice. 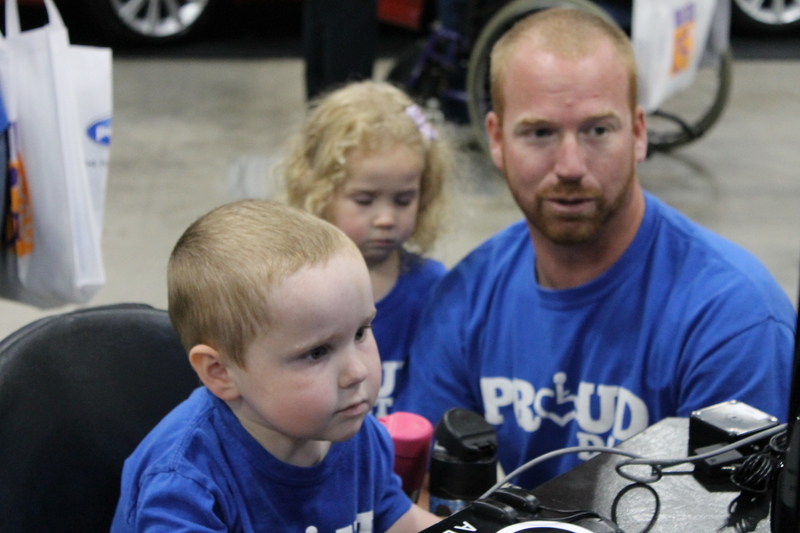 Their road to the top may be filled with difficulties, skepticism, and logistical challenges, but athletes like Brolylegs, N0M4D, Phoenix and Wheels have the right mindset and drive to overcome the roadblocks they face and make a difference. Not only by spreading awareness, but by being an inspiration for kids like them striving to make the jump from amateur to professional.